Seagull One - in Spanish!!!! SEAGULL ONE in Spanish, translated by author Vicente Echerri. A matriarch of Brothers to the Rescue has died. Margarita Campo Schuss--Maggie Schuss to everyone that met her. She was a small woman with a raspy voice and a passion for living. At seven o’clock this morning, the cancer took her body. Left behind are her husband, William “Billy” Schuss, co-founder of Brothers to the Rescue, her three sons and their families, and a community full of people Maggie touched. As was her custom during their fifty years of marriage, Maggie naturally supported Billy when the idea for Brothers to the Rescue came to him. He was watching the news as a fifteen year-old rafter, the same age as his son, died in the arms of a Coast Guard agent. “We have to do something,” he told her. Then he called Basulto and the rest is history. It was Maggie and Rita Basulto who did everything but fly in the early years of the humanitarian organization that saved thousands: press releases, accounting, filling water bottles, being observers on missions, etc. “I always felt I had to work twice as hard for Cuba,” she said in an interview for SEAGULL ONE, “because I was pro-Fidel in the beginning—and Billy and I are one of the few people in exile to admit it.” So for all things <?xml:namespace prefix = st1 ns = "urn:schemas-microsoft-com:office:smarttags" />Cuba—especially for Brothers to the Rescue—Maggie worked twice as hard. Her epiphany came about on February 5, 1960. The moment Anastas Mikoyan put a wreath on the statue of Jose Martí, she knew that communism was the end game for Cuba. In Havana, she worked at the Coca-Cola company and lived with her married sister. Behind her employers’ back, she used the mimeograph machine to print anti-Fidel propaganda. She’d make the copies, tie them around her waist, and hide them under her clothes. Once outside, she’d distribute the pamphlets. Her then-boyfriend Billy Schuss went to prepare for the Bay of Pigs invasion. She didn’t see him for over a year. When he returned from the failed invasion, he took asylum at the Brazilian Embassy. On June 27, 1961, she went to visit Billy wearing a hastily sewn off-white dress (there was no white material to be found in Havana). It still had pins holding parts of it together. It was a Tuesday, and visiting days were Saturday and Sunday, but on Tuesday the friendly guards were there. Father Villaverde, who was also staying at the Embassy, married Billy and Maggie as well as Juan Benito Clark and his fiancée, Leonor. Maggie’s father managed to sneak in two bottles of champagne to celebrate with a tray of bocaditos Maggie had smuggled in. After the ceremony, she went home to her sister’s house. No honeymoon, no conjugal visit, nothing. She never told her employers she was married. She called in sick on October 6, 1961, to flee Havana on a Pan Am flight. She didn’t see her parents for another six years. Several months later Billy was finally able to leave Cuba and they were legally married in the United States. They finally had their honeymoon—a one-day visit to Key West. Maggie Schuss was a pillar of the community, standing at just over five feet tall. She was a model wife, mother, and community leader. She was a memory-maker. You won’t find her snapshot in many Brothers to the Rescue stories because she chose to stay out of the limelight and do the hard work behind the scenes. But ask anyone at Brothers, and they’ll tell you stories about the small woman with the raspy voice who felt she had to work twice as hard as anyone else. They’ll tell you about their memories. They call themselves "Jean's Friends" in honor of Jean Seipp, a dear friend and fellow bookclub member who died of cancer. It was her bookclub friends who were with her during that time. Jean's Friends have been meeting since 2004 and have shared many experiences, good and not so good: a dear friend moved away, three members are breast cancer survivors, two have autistic children, most have seen their kids off to college, and another already has two grandchildren. In-between, they read, including Seagull One. Author and collaborator at book presentation at Barry University are written up in Social Miami Magazine. Lily Prellezo and her book, SEAGULL ONE, are featured in April's Miami Dade College Forum Newsletter. See the April 2011, Volume 15, Number 2, edition of the MDC's magazine, page 16, and see how the Florida Center for the Literary Arts influenced Prellezo's career in publishing her first nonfiction book. Author Lily Prellezo and Jose Basulto were interviewed on WQBA 1140AM from 8-9pm. Host Humberto Cortina went in depth with Prellezo to discuss the writing of SEAGULL ONE. An invitation was sent out to the Miami community to join Brothers to the Rescue for the Vigil for Truth and Justice on February 24, 2010 at 5:30pm in front of HIaleah Gardens City Hall at the Brothers to the Rescue monument. Read syndicated columnist Ana Veciana-Suarez' expose on author Lily Prellezo and her new book, Seagull One, on page 1 of ISSUES & IDEAS in Sunday's Miam Herald. C-SPAN interviews Lily Prellezo and Jose Basulto on SEAGULL ONE at Miami Book Fair International 2010. Check out Pepe Forte's blog, ifriedegg.com for photos of book signing at Libreria Unviersal. Manolo Salvat, president of Libreria Universal (L) Jose Basulto, president of Brothers to the Rescue (R) and friend (in middle) at book signing. Visit Mickey Garrote's blog, NUEVA ONDA CUBA, and read a chapter of SEAGULL ONE in Spanish! Congresswoman Ileana Ros Lehtinen, the official godmother of Brothers to the Rescue, raved about Seagull One yesterday at a luncheon hosted by the Brigade 2506 Center for Human Rights and Democracy. The group's mission is to communicate with political prisoners in Cuba, to give them moral support, as well as to direct its funds to providing necessary supplies and materials for those languishing in Castro's prisons. NBC MIAMI REVIEWS SEAGULL ONE - "A MUST READ!" Reporter Hank Tester declares Seagull One "a must read." 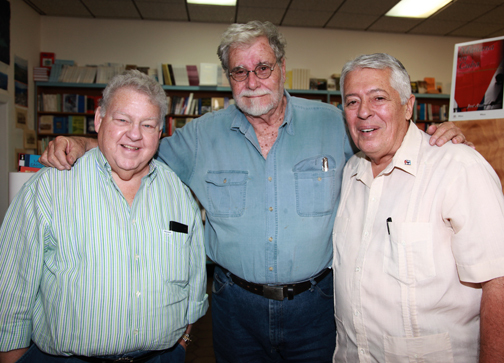 “There ought to be a book,” was the constant refrain during the 1990’s, when Miami-based Cuban exile organization Brothers to the Rescue was constantly in the news. And why not? There were young dashing pilots, veteran CIA operatives, Cuban spies, four plane crashes, battles with the federal government, and conspiracy theories that still abound. Toss in Fidel Castro, desperate refugees on rafts, and a politically powerful exile community, and you have the making of a great book. That book has arrived, authored by Miamian Lily Prellezo. "Seagull One: The Amazing True story of Brothers to the Rescue" is the never-before-told story about the humanitarian organization that saves 4,200 Cuban rafters from death in the Florida Straits. Nineteen nationalities of men and women create unity in multi-cultural Miami when they fly in rickety Cessnas to save the lives of people they will seldom, if ever, meet. And they do it between day jobs and carpool, to prove once again that we are our brothers' keeper. Things really heated up for the Brothers when President Clinton changed immigration policies and stripped Cubans of their special status as political refugees under the Cuban Adjustment Act. The Wet Feet/Dry Feet policy became law, sending Cuban refugees found in the water back to their native country. Basulto, not interested in shrinking from the fight, tested the patience of Fidel Castro by flying over Havana in 1995. Then, six months later, he blanketed Havana with half a million leaflets featuring the U.N. Declaration of Human Rights. The deaths of four pilots, shot down in two planes over international waters by the Cuban airforce, is the climax of the book, but by no means its most controversial plot point. An alleged spy in the organization working for both the FBI and Castro, Juan Pablo Roque, betrays his fellow pilots -- or does he? The suspicions, doubts, and alleged conspiracy between the United States and Cuba linger until the book's final page. The book is a wonderful achievement and a contribution to our understanding of a unique chapter in the Cuban Exile experience. With excellent story telling, "Seagull One" is a historical work that reads like a novel. A massive research challenge that was more than met by author Lily Prellezo's persistence and unique understanding of what drove the men and women of Brothers to the Rescue to accomplish what often amounted to miracles over the Straits of Florida. It is a story of tragedy and triumph, brotherhood, sisterhood, and betrayal. A must read. Seagull One was promoted in the FIU Alternative Theater Festival program, http://fiusummertheatrefestival.com/1.html, which produced Cruz's "A Bicycle Country," expertly directed by Marina Pareja. Three people in a desperate search for a better life leave Cuba on a raft in search for "that something better." Seagull One's advertisement was placed on the "Author's Biography" page of their program. Hopefully it won't be the last time that Pullitzer-Prize winning Cruz and Prellezo appear together! BTTR Pilot Mayte Greco finishes Air Race! In order to celebrate 100 years of aviation and raise awareness for women in aviation, pilots Kristen Jurn and Brothers to the Rescue's first pilot, Mayte Greco, flew through nine states in four days in the Air Race Chics 2010 Classic, http://airracechics.org. Mayte was recently highlighted in AOPA Pilot magazine, http://www.aopa.org, for her humanitarian work with Brothers to the Rescue. On the nose of their Cirrus SR22 was the logo of Seagull One: The Amazing True Story of Brothers to the Rescue. Before the race, Mayte enjoyed a preview of Chapter 6 in Seagull One, titled "The Lady Pilot." Congratulations to Kristin and Mayte!